Studies examining symptom differences between surgeries for breast cancer patients rarely incorporate the effects of adjuvant treatment choice. We sought to understand differences in patient-reported symptoms between lumpectomy plus radiation and mastectomy in the year following surgery. This cohort study used linked administrative datasets. The exposure was defined as lumpectomy plus radiation or mastectomy. The outcomes of moderate-to-severe (score ≥ 4) patient-reported symptoms were obtained using the Edmonton symptom assessment system (ESAS). Line plots were created to determine symptom trajectories in the 12 months following surgery, and the relationships between surgery and each of the nine symptoms were assessed using multivariable analyses. Clinical significance was determined as a difference of 10%. 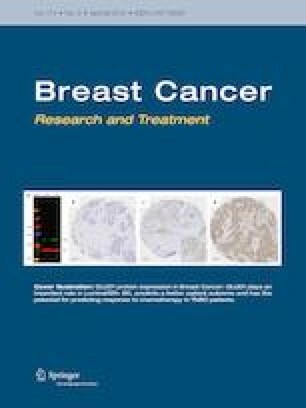 Of 13,865 Stage I–II breast cancer patients diagnosed 2007–2015, 11,497 underwent lumpectomy plus radiation and 2368 underwent mastectomy. Symptom trajectories were similar for all nine symptoms until approximately 5 months postoperatively when they diverged and mastectomy symptoms started becoming more severe. On multivariable analyses, patients undergoing mastectomy were at an increased risk of reporting moderate-to-severe depression (RR 1.19, 95% CI 1.09–1.30), lack of appetite (RR 1.11, 95% CI 1.03–1.20), and shortness of breath (RR 1.16, 95% CI 1.04–1.15) compared to those undergoing lumpectomy plus radiation. Even with the addition of adjuvant radiation, patients who are treated with lumpectomy fare better in three of nine patient-reported symptoms. Further examination of these differences will assist in better shared decision-making regarding surgical treatments. Natalie G. Coburn and Claire M. B. Holloway share senior authorship of this work. The online version of this article ( https://doi.org/10.1007/s10549-019-05196-x) contains supplementary material, which is available to authorized users. Part of this work will be presented at the American Society of Breast Surgeons conference in May 2019. This study was supported by the Institute for Clinical Evaluative Sciences (ICES), which is funded by an annual grant from the Ontario Ministry of Health and Long-Term Care (MOHLTC). The opinions, results, and conclusions reported in this paper are those of the authors and are independent from the funding sources. No endorsement by ICES or the Ontario MOHLTC is intended or should be inferred. Parts of this material are based on data and/or information compiled and provided by CIHI. However, the analyses, conclusions, opinions, and statements expressed in the material are those of the author(s), and not necessarily those of CIHI. Parts of this material are based on data and information provided by Cancer Care Ontario (CCO). The opinions, results, view, and conclusions reported in this paper are those of the authors and do not necessarily reflect those of CCO. No endorsement by CCO is intended or should be inferred. This work was supported by a Cancer Care Ontario Clinical Programs and Quality Initiatives grant and the Sherif and MaryLou Hanna Chair in Surgical Oncology Research.